Good morning! Im still around, just busy with work, which is a good thing. I had a nice birthday, although bittersweet. My DD and SIL and Charlie came over in the morning to help me with some things I can't do myself, like move furniture. LOL. I wanted my desk moved into the 2nd BR which is my office/guestroom. I had bought a sleeper sofa for the room. They brought me over their old TV cabinet which is now at the back of my kitchen. My kitchen is one big room with the back part full of windows that looks out on trees and is very peaceful. I have all my plants by the windows, and put the cabinet which is the same color as my cabinets bel there. It will be a sitting area back there. Kind of hard to explain, but I have the vision in my mind of what I want it to look like. I also had two nightstands that had been in the 2nd BR which don't fit with the sofa. My friend and I decided to swap. She had one small nightstand perfect for the room and she liked mine. SIL brought them over and brought hers back to my house. It was a big help and they brought bagels and my favorite Starbucks! In the afternoon, I went up to DD's and met the boys at the bus stop- they were so excited. They wanted McD's for dinner to celebrate my birthday (they hardly ever have it) so that's what we did. LOL Spent last weekend with the boys. Ryan is on travel hockey and DD had to take him to a game very early in the morning. So I slept over on Fri night and watched the other two. In the afternoon we went to a fall fest not far from my place. The boys had fun although we ended up parking about 1/2 mile away and walking there. Traffic was crazy ---but it was good exercise. On Sunday, I met two friends for lunch. It was great to see them and I must say, I had a good 'birthday week' Read all the posts this morning- got up at 4:30 AM- wide awake. Decided to wash sheets and just start the day before logging into work. It has been great working from home although I do usually go to the office once a week to break it up. I went in yesterday. It's about 50 miles one way, and thankfully I don't have to go in every day. I don't have to go in at all, unless there is a staff meeting or something is going on. Judy- how exciting that you got to go to Yankee stadium for play-off game. Needless to say, my oldest DD is thrilled with the Red Sox. She went to their first playoff game @ Fenway. Well, the sheets are dried, so time to make the bed, get breakfast and get ready to log into work shortly. Have a wonderful day! HI all, Brenda- hope surgery went well Mary- That's funny that Zach got the same teacher that Luke had! Robbie got the same kindergarten teacher that Ryan had! LOL. The boy s were sick with some nasty virus that tCharlie had had (that put him in the hospital for 2 days) so they both missed their first day of school. Ryan was able to go to school on Friday and Robbie will go on Tues (schools are closed on Mon). His kindergarten teacher is going to meet DD and Robbie before school starts since he missed orientation. /She is going to give him a tour before school starts. He doesn't seem to worried. I love your "ugly" blanket, Cindy! and I love mindless knitting. Mindless knitting and crocheting is what got me through this past year. If it wasn't for that I don't know how I would have handled everything that was going on. It was my sanity I had a great visit with my brother and sister in law. Dinner was great (haven't been out to eat since right after we moved in before DH ended up in hospital). We then came back to my place so my brother could see my new digs. My sis in law had already been here when she brought me lots of meals to freeze. She is such a sweetheart and I have always thought of her as my sister. She and my brother have been together since they were teens! Today is a rainy, now cloudy day with more rain tomorrow. I'll be going to DD's tomorrow to watch the NY Giants football game with the boys. I'll miss watching with my DH just as when I watch the Yankees I miss his chatter......Right before he went back into the hospital for what would be the last time, we watched the Yankees together for a little bit... Our anniversary is coming up on the 15th and it would have been our 17th. I feel so blessed that he came into my life and that we had the time together that we did. Hope you are all having a good weekend. 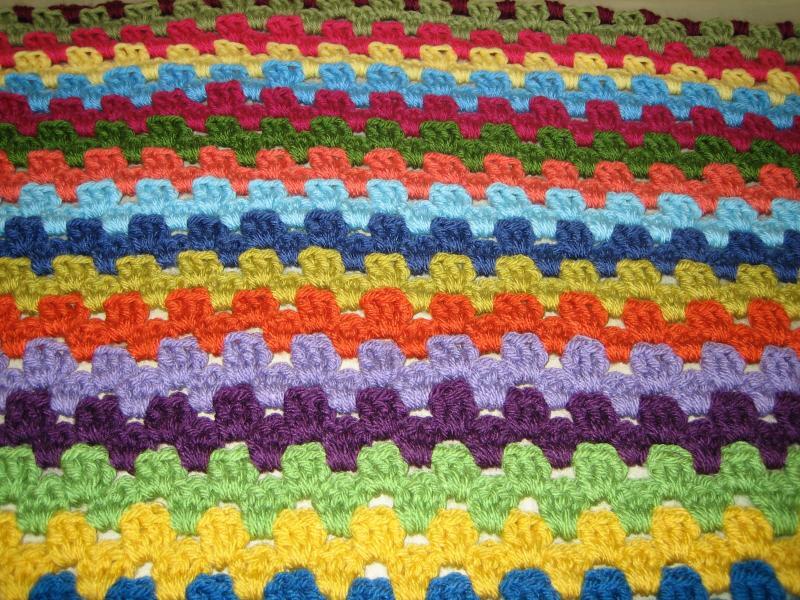 I'm crocheting a blanket for my cousin who I visited this summer. Started it the other night. It's the 'brain dead' afghan. It's been a dreary rainy day here. Basically making this a lazy day other than doing laundry. I've been crocheting the blanket, watching olympics and now dinner is on. I needed this type of day! Getting another estimate for painting on Tuesday and if the price is ok, he is available now. he was recommended by a co worker who lives in the area. Hope you all enjoy the rest of this relaxing Sunday. Good morning Hope everyone is well. We got an estimate for painting Seemed a little high. Getting a few more estimates. So painting is on hold and thus unpacking lol. it is what it is. At least we can function since the kitchen has been unpacked and the bathrooms were scrubbed. Didn't put the linens etc away since I want the linen closet painted. We don't need to paint the clothes closet since it was white and in good shape. we just washed down the walls and cleaned the floor so clothes are put away. Nice to have a walk in closet. I worked from home wed Thursday and Friday which was nice. I'll be going into the office mon tues and wed next week and home thurs and fri. I have my physical on Tuesday am before work so that works out. Last night I started a simple HDC Afghan using three colors, a light grey, dark gray and mint green. I had made one a couple years ago for DH using the AC Moore brand Nicole belle yarn in gray black and white stripes. it has held up well and that yarn was on sale this week so decided to treat myself and make myself one Picked up the yarn last evening and started. It felt good to crochet while watching the opening ceremonies. Today we are going to get shelving units for the garage to free up space and get somewhat organized out there. Lol Have a great day ! Hi everyone! we are moved into our new place. What a crazy busy day yesterday was!!!! I never want to go through this again. It was a long day! Today we spent cleaning the kitchen and bathrooms. So much left to do to call this our home. now that the kitchen cabinets are all cleaned I will unpack kitchen stuff. And a trip to the grocery store is in order. And dh was thrilled that the cable co came today and we have internet and tv!! Tonight we are going out to dinner and taking my friend who lives 5 houses away since she was a big help to me today scrubbing the kitchen!!! Haven't caught up yet with what everyone's been up to but wanted to let you know we finally closed and moved in. Wow haven't been on in weeks and glad to see Brenda , Mona and Bailey! We are knee deep in the moving process. Had a dumpster delivered on Friday and spent the weekend tossing things. We posted stuff for free and we're able to get rid of lots of things. I'll be glad when this is done. It does feel good to let go of so much. Downsizing and knowing there won't be room makes it easier to let go. Right now closing is scheduled for 2/2. Today is a day off for the holiday so more packing have good day everyone!! Happy Friday! In case I don't get back here wishing you all a happy healthy 2018!!! Merry 🎄Christmas everyone!!! Had a wonderful Christmas Eve and today was spent purging. its cold, but no snow thank goodness. Going to be bitter cold all week. I'm working half day tomorrow and in the afternoon my son in law is coming over to move stuff out of the attic. I have a feeling most will not be kept. Photos are probably the only things I want to hold on to from up there we had moved the Christmas decorations down from the attic a few years ago and they are in the crawl space in the garage I didn't unpack them this year ! The rest of the stuff in the attic I apparently haven't needed in a couple years, so I'm not goi g to spend too much time looking through it. the good thing about moving is it is very easy to let go of things! Have a good week! Hi all!!! i have barely had time to get on the internet. Lots going on here. Dh and I decided to move to an over 55 community. The stairs are getting difficult for him due to some neuropathy in his legs. So long story short, we have sold our house and found a detached ranch in a lovely community south of here in Ocean County. Funny thing is one of my friends lives there and the house we bought is 5 doors away. She is so excited that we will be neighbors. Our weekends were consumed with looking for a place to live. Our house was sold with the contingency on us finding a place. The buyers have been very accommodating and our closing is set, at least as of now, for the beginning of February. Now we are purging and packing. I will be working from home 2-3 days week so even though we r moving farther from work it's a pretty direct ride on the parkway. And we will be about the same distance from youngest DD, just the opposite direction. I will be further away from DD and Jali though, but since the new place is only a mile from the parkway, to will be an easy ride. I did manage to finish some scarves for gifts and some hats. Today I'm getting my hair colored and after that some more packing. We are spending Christmas Eve at my DDs mil annual gathering. Oldest is staying in Boston. Planning to see DD and Jali on Christmas Day. Wishing you all a very joyous, blessed Christmas. Just wanted to pop in to let you know I am well and will probably not be here much until after the move. I said I was never going to move again.....and here I am. Lol. This is definitely the last one! Hi all had a wonderful weekend filled with my daughters and grandsons. DD got to watch Ryan skate today before I took her to the train. They were so cute and kept telling her that they wanted her to stay longer. She stayed at their house this time and they really enjoyed having her there all day from the time they woke up until they went to sleep. My youngest hosted an amazing thanksgiving. ! Yesterday middle DD asked me to make a hat for Jali so I just finished that. I had bought the cupcake yarn and it came out cute. Just hope it fits. I'll try it on him next weekend. Working on a knit scarf for my middle since I gave one to my youngest for her birthday and gave oldest hers when she was her. I'm using the scarfie yarn and the pattern is boyfriend scarf on ravelry. Easy and comes out nice in the scarfie yarn mary glad your DD and fam had a good time at the coast and that you had a good visit with Sue. Good luck on Tuesday! Cindy, I hope you are feeling better. Marlene I agree with you wholeheartedly. I avoid the stores like the plague on thanksgiving and day after Although I did stop at the Carter's outlet on the way to DDs on Friday since she had to,d me Ryan could use pjs, and the boys could all use some new socks. The store was not crowded and I got a few things for each of them as well as Jali and only spent 45. The rest of my shopping is happening online. Actually have a few things in my amazon cart. Going to check prices tomorrow morning for cyber Monday and then going to " checkout". Have a good Monday! Judy, Marley is adorable and love the blanket. Those pot holders hot pad are so cute. I will go check out his FB page cindy. Looks like from your FB posts that you are getting the hang of your new software system!! Marlene I sure hope you can get back to the coast for the winter! Mary. I finished a knitted scarf that I gave my youngest and also two crocheted scarves with Caron cakes for Christmas gifts. I am working on a knitted scarf for my oldest with the scarfie yarn she picked out when I visited her in Boston. Promised I would have it finished when she comes down for thanksgiving. We are having thanksgiving at youngest DDs house. She has the most room. I am helping her. Leeann hope all is going well with the job and your crafting. How is your DS doing? And hope that your DD is well on her way with the fundraising effort I am heading to CT tomorrow for the week for a training class for work. I'm definitely packing yarn for the evenings although I suspect I may have some studying to do. I come back home fri afternoon. Have a great week !! !